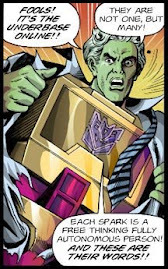 SLAMDANCE: Hello, Cybertron and with the election nearing, many Cybertronians are wondering just who should be the lucky candidate for Prime? For the Generation Ones, we have Grimlock. For the Generation Twos, we have Rodimus. Grimlock supports a strong military to protect the citizens of Cybertron from Decepticon insurgents as well as mining for more Energon as well as looking into alternative fuel sources, such as Nucleon. Rodimus supports socialism. ROOK: That’s a hardly fair. Rodimus supports many issues that resonates with the population. He’s not only for alternative fuel sources but his main concern is to bolster our economy, as we teeter on a recession. We were so close to entering a new Golden Age but the current Optimus administration totally bungled our fuel sources along with our economy with his meaningless war. SLAMDANCE: The war was not the fault of the Optimus Administration, but that of the Sentinel Administration. ROOK: Oh, you First Gens like to believe that. SLAMDANCE: It’s true, had Sentinel Prime been strong to actually stand up to these Decepticons when they were a lesser threat, we could have avoided a long drawn out war. Optimus didn’t start the war. They did. He just finished it. ROOK: But he didn’t finish it. The Decepticons are still around, and now there’s a multitude of smaller factions rising up in the vacuum of the Decepticons. Sweep uprising, Quintesson terrorism, and let’s not forget that there’s the Predacons right over there, that while we’re running around chasing fictional boogey bots who might want to drop a Hate Plague on us, their economy is booming an we’re heading toward the largest transfer of power in Cybertronian history. That’s why Rodimus is the right choice for change. Grimlock is just another Optimus Prime. We just cannot afford another four million more years. 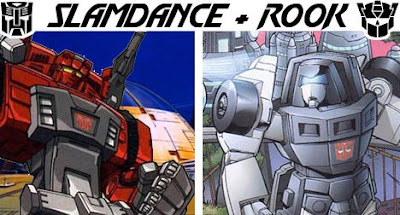 SLAMDANCE: Grimlock is nothing like Optimus Prime. They’ve opposed each other on several key accords. ROOK: But he still sided with Optimus, 90% of the time. SLAMDANCE: Because he was working toward a same goal, a safer and more secure Cybertron. While he disagreed with many of Optimus’ policies, that is one goal that they both shared. A desire for a safe ad peaceful planet. Something I’m not too sure Rodimus feels the same about. Rodimus may one day be a great leader, but right now, he’s too young and inexperienced. He doesn’t have the credentials that Grimlock has. SLAMDANCE: Moonracer has been around a lot longer than Rodimus, and has much more experience. She was part of the resistance movement against Shockwave during the Great War and served under Elita-1. She’s served as a strong leader and role model and said no to the Space Bridge to nowhere. And at the very lease, she sees eye to eye with Grimlock on the issues. Ultra Magnus is the exact opposite of Rodimus’ claims. He’s been preaching “change” since he started his campaign, but Magnus, who’s been around since before we both came online is the exact OPPOSITE of change! He’s the living contradiction for his entire campaign. He’s had the opportunity to step up to plate and swing for leadership multiple times, and he’s always bunted the ball. How is this supposed to be any different? ROOK: Well with Magnus, Rodimus has a spokesman that can speak to the people. Together they czn make true change for Cybertron and make it quickly. SLAMDANCE: Just because Rodimus is faster, doesn’t make him better. ROOK: Why is it whenever you First Gens always bring up the race issue? Yes, Rodimus turns into a race car and he’s not a slow lumbering lizard or semi truck. That doesn’t mean he’s incapable of the job. ROOK: You First Gens always want to remain stuck in the past and never move forward, but you have to. We’re not immovable die cast bricks anymore. Embrace the change. SLAMDANCE: Is that your answer for every time you Second Gens start to lose an argument? To play the racing card? Fine, we’ll go that route. Rodimus has had a few too many questionable acquaintances over the years. Pacifistic Anti-Cybertronians, like the Paradrons. Friendships with unrepentant Decepticons like Blitzwing. And let us not forget how a keen-eyed future leader like Rodimus can be mentored by Kup for so long and supposedly miss all that he said? His “record breaking funding’ for his campaign seems to have questionable sources, like Nebulon and the Matrix Templars. And I won’t even bring up his religious beliefs, where he claims to be the chosen one. ROOK: Shall we go into Grimlock’s associations with the Dynobot 5? The simple fact is that we need change for Cybertron and Grimlock wants to put us back in the past as opposed to moving us toward the future where we need to be, which is what Rodimus wants to do. SLAMDANCE: That’s most certainly debatable, but we are out of time. Thank you for joining us tonight. Join us again next time as we talk with Former Optimus Aide, Prowl and his thoughts on Grimlock. ROOK: Good night folks. Vote early and vote often! Simply brilliant. The parallels are funny and spot on. Great commentary on both the fandom and American politics. Well done.